After I first received my Reiki level I attunement I walked around becoming familiar with how different things responded to my Reiki hands. I experienced a huge pulling sensation in my hands whenever I hovered them around plants. It was beautiful to feel this life-force connection and I was amazed by the receptivity of living things to Reiki. One day I visited a friend at his home and we talked about how incredible Reiki is. He’d been asked to care for a plant while a friend of ours was away and it was in a bit of a sorry state, looking like it might not make it. He encouraged me to offer Reiki to the plant, which I did. The pulling sensation I’d felt before was so strong with this poor withering plant. It must’ve drawn a lot of Reiki. The very next day my friend told me that the plant had made a seemingly miraculous recovery. It was no longer withered and had become bright green and radiant again. 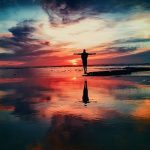 As a beginner Reiki practitioner this experience became one of many that helped to remove any lingering skepticism I still held about the power of Reiki. Since then I always use Reiki to rescue any struggling plants and often send a maintenance blast to keep them healthy and flowing with life force. Plants are like us in many ways. They also have an etheric or pranic body, without which they would not be alive. 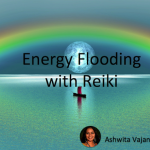 Everything is receptive to energy and Reiki works for plants too simply because once the connection to universal source energy is established it is drawn by the plant according to what is needed. Reiki works with plants just like it works for us. Like us, plants also have a bio-energetic network which knows how to receive and distribute energy like Reiki for optimal balance. Have you seen the etheric layer around plants? It’s easiest when there’s a clear plain background like the sky. Relax, allow your eyes to soften and simply perceive a silvery white layer extending from the plant. This is the vital etheric energy of the plant. When a plant receives Reiki it is rebalancing and replenishing this life energy. To channel Reiki to a plant first consecrate as usual to make sure you’re honoring the Divine Consciousness and not yourself for the healing. Then proceed just as you would for a person. I usually scan the plant to feel which part wants the most Reiki and allow the plant and the Reiki to guide me. I always place my hands around the pot if it’s a pot-plant to energize the roots. End the treatment with a grateful thought to Reiki and for the Divine Grace that allows for healing. There is something very peaceful about spending time with plants in this way. It’s always profound to connect with nature so deeply and humbling to experience the intelligence of life that has been here so much longer than we have. After my first attunment I became familiar with more a tune with myself and everything around and love of them. I have done some Honda on to a family member a da friend and my teacher . I hope they gained some relief after! May they all stay well till I am asked again!